In conjunction with the Carolina League and Minor League Baseball, the Myrtle Beach Pelicans are pleased to announce that the club has been recognized with two end-of-year honors. The Pelicans are the Carolina League's nominee for the John H. Johnson President's Award, as the Carolina League honored the Pelicans with the Complete Franchise Award. 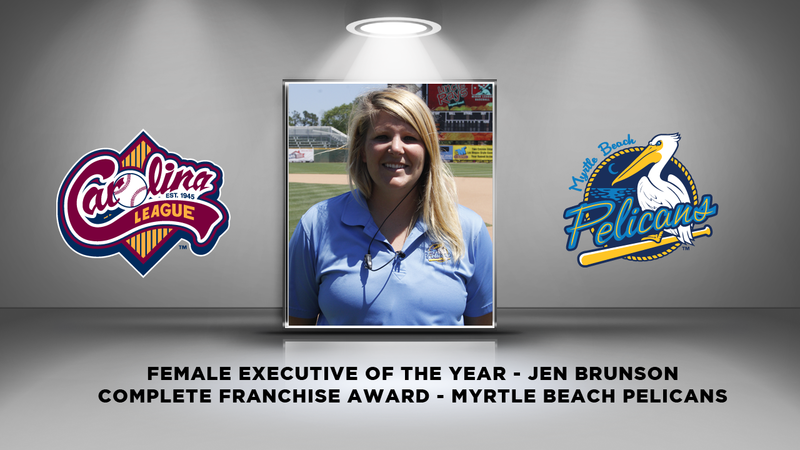 In addition, Pelicans Assistant General Manager, Community Development Jen Brunson has been named the Carolina League's Female Executive of the Year. The Complete Franchise Award is based on franchise stability, contributions to league stability, contributions to baseball in the community, and promotion of the baseball industry. It is considered the league's top honor. As the winner, the Pelicans are the league's nominee for the John H. Johnson President's Award which will be presented in December during the Baseball Winter Meetings. The award is named after John H. Johnson who served as the President of Minor League Baseball from 1979 to 1988. In 2017, the Pelicans set franchise highs for in-season revenue and contracted ticket sales for the second consecutive year. The team continues to be ranked as a Top Myrtle Beach Attraction by TripAdvisor and received the travel site's Certificate of Excellence for the third consecutive year. Brunson, the driving force behind the club's community outreach and promotional planning, won the Female Executive of the Year, which is awarded to a woman who has made outstanding contributions to her club, the league, or to baseball. As the winner, she is now the league's nominee for the industry wide Rawlings Woman Executive of the Year Award which is also presented at the Baseball Winter Meetings. "We are always proud when we are honored by our peers, the league, and Minor League Baseball," commented Pelicans President and General Manager Andy Milovich. ""I continue to be amazed by Jen's contributions to the Pelicans, Myrtle Beach and our industry. In addition to sitting on multiple boards in the community, she sets the tone for our office culture, ballpark experience and participation in the MiLB Promotional Seminars, Women in Baseball and so much more. She's incredible!" The 2017 season was Brunson's ninth season in Minor League Baseball and the Myrtle Beach Pelicans. The is the second time Brunson has been recognized as the top female executive in the Carolina League, having captured the title in 2014. Brunson began her career as an intern with the Pelicans in 2009. After two seasons in that role she was promoted to serve as Director of Promotions for the Pelicans. In September of 2013 she earned the title of Senior Director of Community Development. Prior to the 2017 season, Brunson was again recognized for her efforts and promoted to Assistant General Manager for the Pelicans. "Working with the talented members of our staff is rewarding enough and then to be presented with this recognition is over the top," stated Brunson. "I am so grateful to be part of the Pelicans family and to have the opportunity to work for the best team in MiLB." Originally from Felton, DE, Brunson graduated from North Carolina State University in Raleigh, NC with a bachelor's degree in Business Administration with a concentration in Marketing in 2007. She also obtained a minor in Sports Management. The Pelicans return to TicketReturn.Com Field at Pelicans Ballpark in 2018 which marks the 20th season for the franchise and fourth as the Class A-Advanced affiliate of the Chicago Cubs. For information on tickets to see the Pelicans in 2016, please call (843) 918-6000, e-mail info@myrtlebeachpelicans.com, or visitwww.MyrtleBeachPelicans.com.